Yesterday Amazon launched their newest Amazon Echo Input for the Indian audience. Echo Input is essentially a small device which converts any of your ordinary set of speakers into a smart speaker giving them access to Amazon Web Services with the help of Alexa. 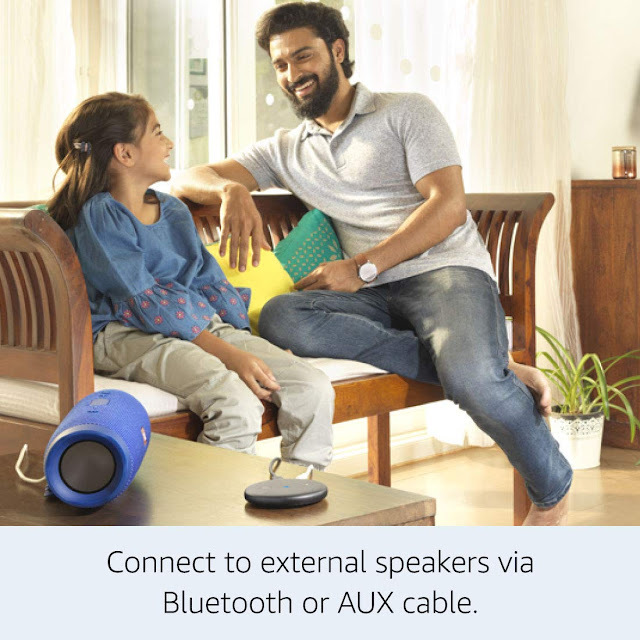 You can connect your Echo Input to your speaker via the support of a 3.5mm audio connector(Cable has been included in the box), or via Bluetooth just in case you have a wireless speaker. After the connection is complete, you can keep yourselves entertained with the help of Alexa as you can utilise thousands of Alexa Skills from the Skills store. The Echo Input comes with a four-microphone array setup so voice detection would be good enough that you can invoke the Alexa Assistant from quite a distance. Speaking about it's all around form factor, the Echo Input is 12.5mm thick which is practically less than a deck of cards as quoted by Amazon's spokesperson. So it's sleek form factor helps it blend easily into any room. To check the additional functionalities of the Echo Input, one can use the Alexa App by downloading it from your respective app stores(Android/iOS). With the help of the app, you can create multi-room pairs to add a twist to your existing audio setup. 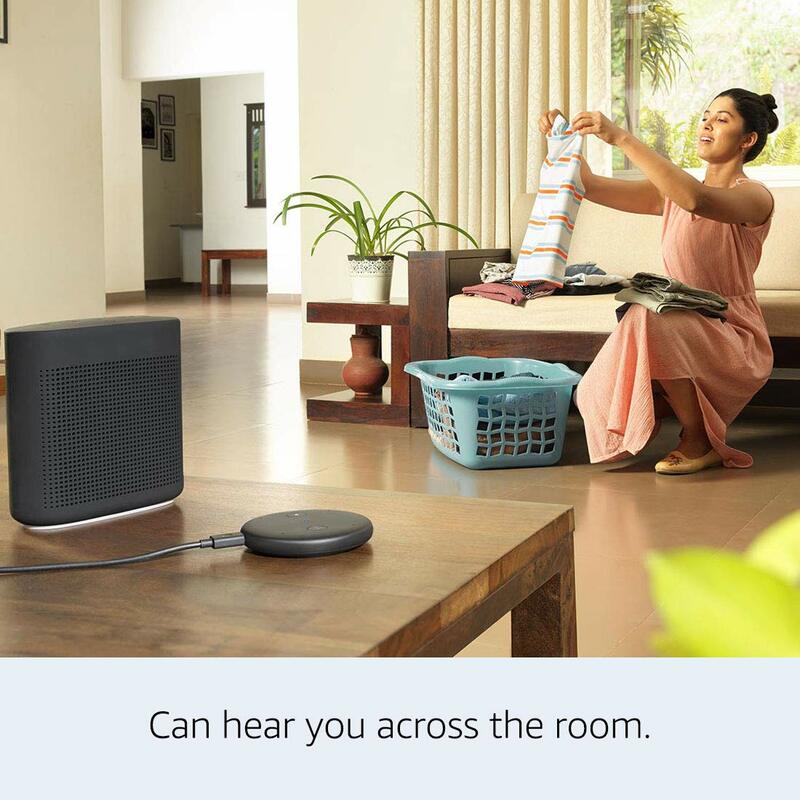 Here if you have not connected your Echo Input to any other proprietary speaker, you won't be able to listen to the audio played as there are no speakers present on the Echo Input, which is unlike the small speaker present on the Echo Dot. However, you can control the volume of your Echo Input with your voice, though still the output of the same would be reflected on the connected speaker. Speaking about Audio, we are familiar with the fact that Amazon Prime Music subscription was announced earlier with Echo Legacy devices, which later expanded to Saavn and TuneIn. Well now with the help of the new launch of Echo Input, you can now enjoy your favourite music from the additional streaming services such as Hungama and Gaana starting today on all of your Echo Devices. There is some early launch offers with the all-new Echo Input as well with the following brands - Bose, JBL and UE Boom. So when you purchase specific speakers from these earlier mentioned brands, you get up to Rs. 2,999 off. You can find the details listed here: Echo Input Offers. The Echo Input is available at a stand-alone price of Rs, 2,999 and it would be shipped immediately once the order gets placed. It'll also be available locally in Chroma, Vijay Sales and other offline retailers shortly. 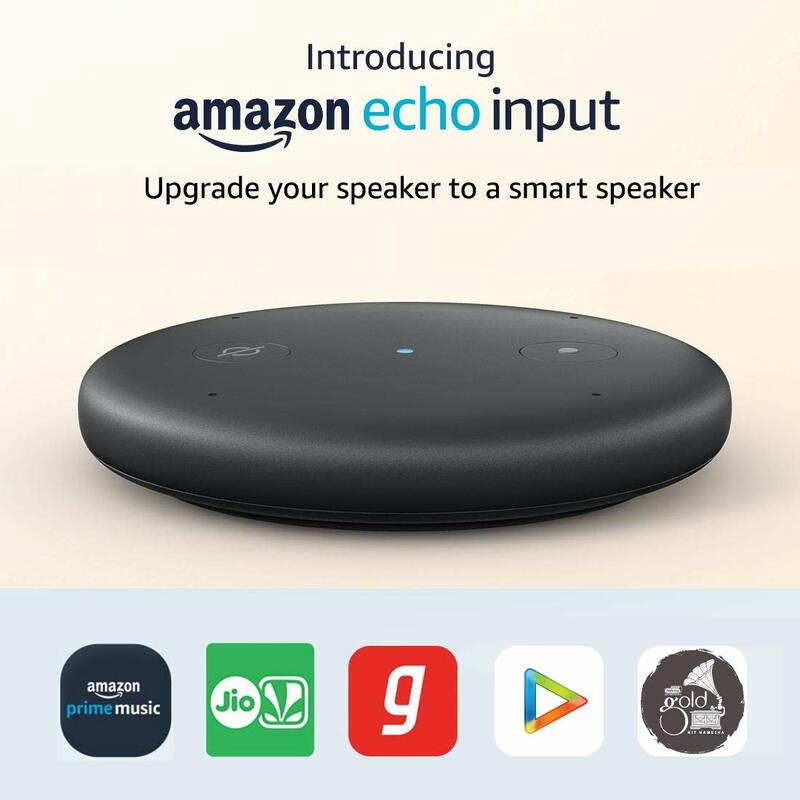 So the Echo Input finally joins the family of Echo devices in the Indian Smart home space adding the power of Alexa without disrupting your existing audio setup.